Check-in or late checkout UNLESS OTHERWISE SCHEDULED WITH GULF BEACH RENTALS. CHECKOUT PROCESS –When checking out, please remove all trash and place it in the designated recepticle. Please run the dishwasher and strip the beds. NOT DOING THE ABOVE THINGS MAY RESULT IN ADDITIONAL CHARGES. fine if there is evidence of a pet(s) in the condo. DAMAGE/RESERVATION DEPOSIT – All properties require a security deposit. This deposit will be returned to you via your original payment method w/in 10 days of your departure as long as the unit is left in good condition and there were no damages or items missing. 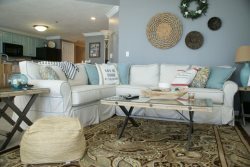 By agreeing to this rental agreement, you also authorize Gulf Beach Rentals to charge your credit card for any damages in excess of your security deposit. PAYMENT – An advance payment equal to 35% of the rental rate is required at the time of booking. The advance payment will be applied toward the rent. Please make payments via credit card or personal checks payable to SeaMitchell Realty and Gulf Beach Rentals. The advance payment is not a damage deposit. The BALANCE OF RENT is due thirty (30) days before your arrival date. CANCELATIONS - A thirty (30) day notice is required for cancelation. Cancelations that are made more than thirty (30) days prior to the arrival date will be fully refunded subject to a $100 cancelation fee. Cancelations or changes that result in a shortened stay, that are made within 30 days of the arrival date, forfeit the full advance payment and reservation deposit. Cancelation or early departure does not warrant any refund of rent. MONTHLY RESERVATION CANCELATIONS – Monthly renters must cancel one hundred twenty (120) days prior to check-in. Monthly renters who make a change that results in a shortened stay must be made at least ninety (90) days prior to check-in. MAXIMUM OCCUPANCY – The maximum number of guests is limited by each individual unit. Additional guests will cost a maximum of $100/night per person. NO DAILY HOUSEKEEPING SERVICE – While linens and bath towels are included in the unit, daily maid service is not included and not available. We suggest you bring beach towels. We do not permit towels or linens to be taken from the units. PARKING PASSES – Parking passes will be available in the unit upon arrival unless otherwise noted. Parking passes are limited to 2 per unit. HOT TUB – No children under the age of 12 permitted in hot tubs at any time. When using the hot tub, remember there is a certain health risk associated with this facility. Use at your own risk. are maintained by individuals not associated with Gulf Beach Rentals. If they are dirty, please let GBR know and we will get someone out to clean it. DO NOT STAND ON THE HOT TUB COVERS. Hot tub covers are for insulation purposes and are not designed to support a person or persons. They will break and you may be charged for replacement. Remember when not using the hot tub, leave cover on so hot tub will stay warm. FIREPLACES – The fireplace is a non-vented propane gas log fired firebox. Please do not throw any paper or other combustible materials in the fireplace. Fireplaces are turned off from April 15-September 15; they are not operational during this time of the year. o Any advance rents collected or deposited for a reservation that is scheduled to arrive during the "Hurricane Warning" period. TRAVEL INSURANCE – We highly recommend all guests purchase travel insurance. If you wish to purchase travel insurance, go to www.InsureMyTrip.com or another travel insurance provider for details and to purchase. All of the units are privately owned; the owners nor Gulf Beach Rentals are not responsible for any accidents, injuries or illness that occurs while on the premises or its facilities. The Homeowners are not responsible for the loss of personal belongings or valuables of the guest. By accepting this reservation, it is agreed that all guests are expressly assuming the risk of any harm arising from their use of the premises or others whom they invite to use the premise.